Lily the cygnet, or baby swan, thinks she’s going to have a simple life–grow-up peacefully, have a mate and cygnets of her own, and most of all, be happy. But when Lily learns that her species is being hunted by humans–and is becoming endangered because of it–she realizes that she doesn’t want her happily ever after anymore. Instead, she wants to make a difference…But how can she help her dying species? And as if the young bird has enough to worry about, a sudden forest fire rips her beloved home apart, and she is separated from her family. Lily will finally have the chance to go to Horizon of Nature, the wondrous place where all animals live in peace–not to mention the only other place besides Forest of Ferns where her kind lives. And to Lily’s surprise, she won’t make this journey because she wants to, but because she needs to: Horizon of Nature is where she has hope to reunite with her family. Written by Natalie Kwong, the author of “Natalie’s Notebook: Stories from the Heart”, when she was eleven-years-old, Lily’s journey to accomplish her dreams should not be overlooked. Natalie Kwong had always dreamed of publishing her own book. At five-years-old, she constructed her own books from scraps of paper and notebooks. At six, she learned how to form her ideas and fantasies into words and sentences. At eleven-years-old, she turned her dream into a reality when she published her first book, “Natalie’s Notebook: Stories from the Heart” in 2012. And even though her goal was complete, her love for writing grew even stronger. When she’s not at school, doing homework, or hanging out with her friends, Natalie is writing or coming up with her next book plot. 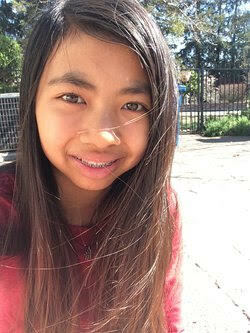 She currently lives in California, and is a fourteen-year-old girl in eighth grade. – Welcome to the Pound, before we get started I have to ask, your new book features a number of animal characters yet the brave and noble Bulldog does not feature. Any chance this will be corrected in the sequel? Hi, thank you so much for having me! Bulldog seems like a wonderful animal and would make a great addition to my collection of unique characters. I am working on the sequel, Broken, right now, and unfortunately Bulldog isn’t currently planned to have an appearance. I have the feeling that an interaction between Bulldog and the swans wouldn’t exactly be friendly! Lily and her friends are working to save their dying species, which means stopping the humans who are hunting them. I’m not sure how Bulldog would feel about that, as he is already friends with people (though not the evil Hunters that are threatening Lily). – You’ve been writing and publishing from a very young age, what was the driving force behind the creative pursuit? Writing has always come very naturally to me, and I love doing it. I turned my ideas into words, into sentences, into stories, since I’ve been able to. I love creating my own world and characters. There’s also something very satisfying and self accomplishing to look back at your work and think, “Wow, I wrote this!” or “Wow, look how much I’ve approved!”, depending on the quality of the work. If I write something I’m not proud of, it just motivates me to work harder. There’s no right or wrong in writing, because it’s your own story to tell. And that makes writing so beautiful. It still amazes me that black ink words on white paper can paint such vivid worlds in your mind. All of these things made me engrossed in writing, and eventually publishing my own book. I was an avid reader during elementary school–I still am, in fact–which just heightened my creative writing. There’s a certain aspect of learning writing skills through reading that no writing class could ever teach. What was a hobby turned into something more intense. I’ve always wanted to publish a book, and in fifth grade I seriously looked into it. I wanted people to admire books I write like I admire my favorite books. I self-published my first book, Natalie’s Notebook: Stories from the Heart, that year, and it is a collection of those first poems and stories that started my writing passion. It really helped that I’m good with computers, and I was able to do the entire publishing process–including formatting, artwork, etc.–by myself at age eleven. – Shattered is a unique take on the fantasy genre. How did the concept come to be? The concept of Shattered started years ago, maybe when I was ten-years-old. At the time I was very interested in animal stories, and I wanted to write my own. First, I had to think of an animal. Horses and wolves were really big at the time, and I wanted to write about an animal less common. I also thought to myself, “What animal can fly, walk, and swim?” because I wanted to write about an animal that was capable of many things, thus giving me more opportunities for the characters. Obviously, the answer was swans. They were also more interesting than, say, geese and ducks. I came up with the title, “Horizon of Nature” first, then started building up the idea that swans were becoming extinct. At first, my idea was for this group of special birds of different species to carry around this egg-shaped stone, representing life, that healed the earth wherever it went. I quickly scrapped the idea, because I wanted to write something more realistic and less magical. The reason for their endangerment, I decided, would be both natural causes (forest fire) and human inflicted (hunting, feeding them bread, which is unhealthy for birds). From my reading, I discovered that the two most popular trilogies in my age group, The Hunger Games and Divergent, both followed a pattern that I would use for mine. The first book introduces the overall problem, but focuses on the main character’s own struggles. The second book is the transition, where the main character starts dealing with the huge conflict, and everything is building up and ends with a cliffhanger. The ending, of course, is the conclusion where the problem is solved one way or the other, and everything gets wrapped up. – I understand that this is a planned series that will likely end as a trilogy. Have you began book 2 and when do you anticipate its release? Yes, I have started book two! It is called Broken: Book Two in the Horizon of Nature Trilogy, as I have briefly mentioned before. As for its release, it is really hard for me to plan when I will finish because writing, to my disappointment, is not my main focus right now. I am working on it over summer vacation, but I am starting my freshman year at high school in August and I will also be doing cross country after school in the fall, not to mention homework. I’ll write on the weekends when possible, but even when I do finish writing I still have to think about editing, formatting, the book cover, and finishing up the publishing process. I was hoping to finish by the end of the year, but sometime in 2016 would be more realistic. I wish I could give a more exact time! I find that holding the physical copy is very rewarding. Not a proof copy, but the actual final product. It is really accomplishing to see all my work come together, knowing that for the longest time my book was just an assortment of different files on my laptop. Also, it’s nice to see my artwork in person, since I design my own covers. The first time I saw a copy of Natalie’s Notebook, I couldn’t believe my eyes! It felt so amazing to hold my own book in my hands, and I wasn’t even out of elementary school yet. – You chose to self publish the book, was the reason you decided to move forward and put this on the market yourself? Well, Natalie’s Notebook was kind of the test book, where I was learning the ropes of self-publishing and how it all worked and to see if I liked it. 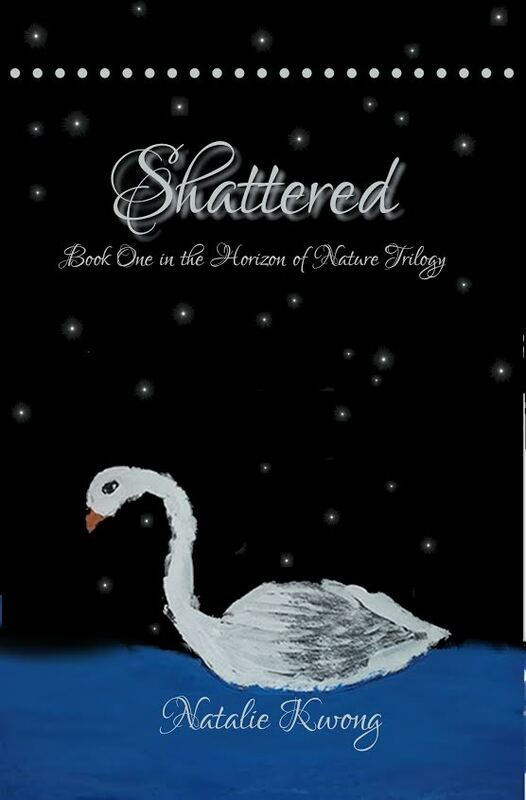 As it turned out, I did like the process of self-publishing and it was nice that I had complete control over my work and book, so I decided to do the same for Shattered. I know it is very hard for an indie author to get traditionally published, and even if I do have a chance at it, it would take awhile to publish books that way versus self-publishing. And I wanted to get my books out there as soon as possible because of my age. I didn’t want to wait for the slim chance of being traditionally published while I had this work that was ready to go out, which meant I could say I published a book at 11 to 14 years old. I considered that a bigger feat than being simply published by a publisher at who knows how old. So I told my mom I was going to self publish Shattered, a story I had been messing with for awhile now, and my mom was very supportive about it. The only thing that bugs me is that some people my age tell me “It doesn’t count”, even though they don’t have a clue about publishing or the first thing about it. – What did you find to be the biggest hurdle in the process? The biggest hurdle in the process for me is really sitting down and putting my mind to it. Once I get started, I can work on my book for hours and days at end, but it’s hard to start working for me. It’s difficult for me to focus on solely on my book when I have other things in my mind, but once I do, I get a lot done. And once I get in the right mind zone, then it gets hard for me to stop! Another big hurdle is marketing. As I’ve said, writing/publishing is not my biggest priority, and marketing isn’t either, but it’s hard to find inexpensive ways to get my book and name out there. I write because I enjoy it, and I’m not concerned about making or money or anything, but it would be great for people to read my work. – What advice would you give to young authors looking to express their creativity and follow your path to publication?